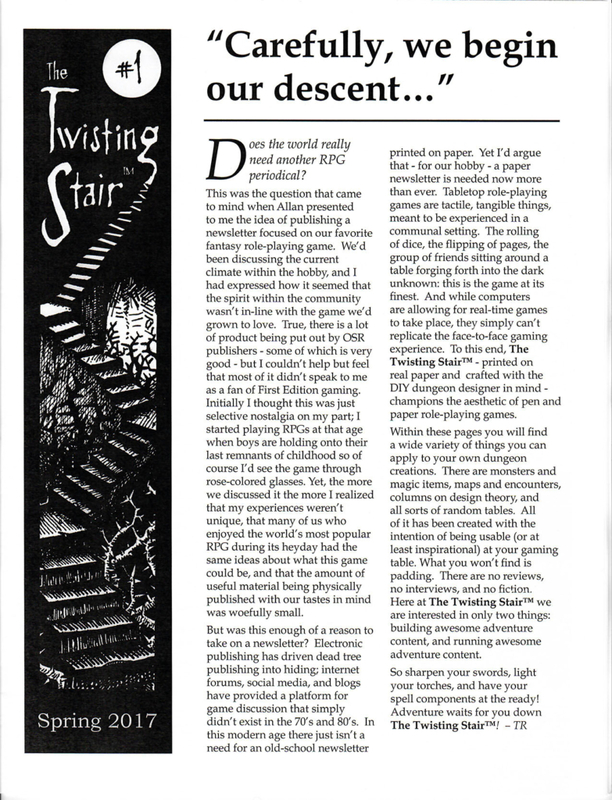 For a 16-page fanzine, I am really impressed with Allan T. Grohe Jr. and Tony Rosten’s The Twisting Stair #1! 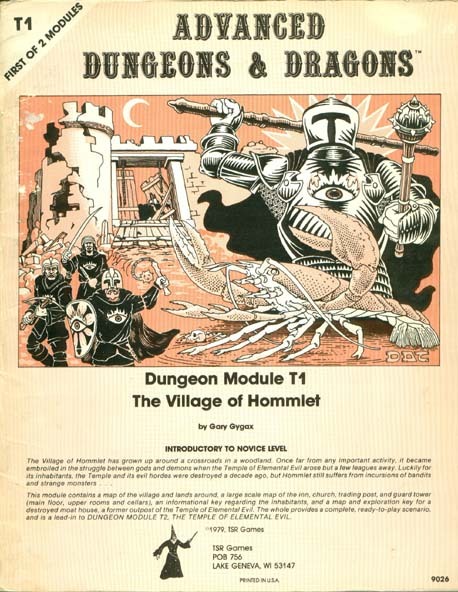 It is packed chock full of fun, and well written pieces of fan additions or alterations to the Advanced Dungeons & Dragons game. From Kuroth’s Quill is Allan’s regular design column, in this case covering the topic of finding treasure maps as part of combined hoards in the mega-dungeon setting. Allan does a great job of backing his personal fondness for treasure maps with strong rationale and solid mechanics (in the form of very 1st Edtion like linked tables) for adding such treasure maps to anyone’s campaign. For someone who doesn’t often include maps as part of my treasures, Allen’s column got me excited about the prospect of adding treasure maps to my own campaigns, in no small part because he makes it easy with all of his tips and the aforementioned tables. Next is a one page section containing a monster and a magical treasure. In this case the Sasquatch and Ring of Reflection respectively. Tony’s Sasquatch is an interesting low-to-mid level creature with very interesting abilities to explain some of the strange and often varied stories of Sasquatch sightings in our own world. Allan’s Ring of Reflection is quite a powerful item that is mostly intended for use by illusionists, but can be used by any character class. My one criticism of this items is the failure to provide citations for the source of several spell effects I wasn’t familiar with. I did eventually find projected image, and shadow door in Unearthed Arcana, but undetectable lie is still a mystery. I would think a short notation pointing to the source would be easy enough to squeeze in. The final section, and the meat of the issue, is Tony’s column on megadungeon design. Tony includes a lot of solid advice for creating the first and arguably most important level of a megadungeon, the first level. He explains how it sets the stage for the rest of the dungeon and a few example encounters are given. 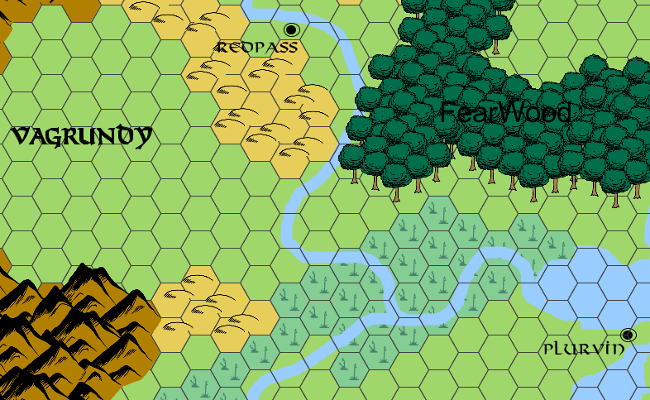 The center spread of the issue is the map for the first level of the exercise and this map includes three blank spaces to insert geomorphs so each Dungeon Master can make the dungeon their own. Nine geomorphs are included at the end of the issue along with three additional “blank” templates so Dungeon Master’s can draw their own. I think this is a fantastic idea and I can see great utility in this for published adventure modules. Also included is a sample Wandering Monster table (much love for this! ), and a small ad for Black Blade Publishing Allan, and Jon Hershberger’s publishing business. In conclusion I have to say I love the idea of this small fanzine and I hope Allan and Tony will keep up with it! Please go on over to Allan’s Blog From Kuroth’s Quill to order your copies today! I understand copies of both Issue #1 and #2 are still available. Well done gentlemen!